When I was eleven, my cousin Kirk died. He was born with a developmental disability and he never walked or talked. He died when he was only six and his funeral was the first I attended. The funeral remains an iconic memory; the assembling of the extended family at the funeral parlor, the procession to Holy Family Church, the ritual of the Catholic funeral mass, and the period of hushed sadness. When I was a little older, one of my paper route customers died and my mother suggested I visit the funeral parlor to pay my final respects. I must have been thirteen, the age at which a young woman was mature enough to do such things alone. 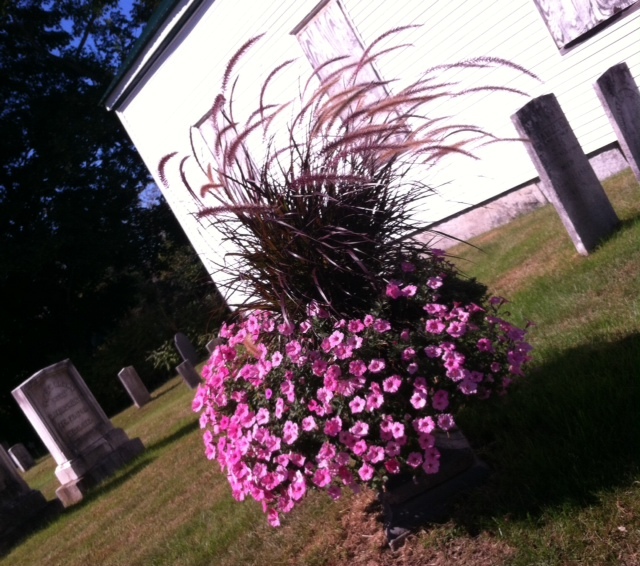 I walked to the funeral parlor, signed the guest book, and extended my condolences to Mrs. Beganny. My paternal grandmother died during one of my college summers. I was working at the shoe factory and I heard my name announced over the loud speaker. “Julie Baumer, please come to the supervisor’s office.” I nervously approached the office door, wondering if I had stuck one of my piecework tags on my production sheet upside down. No, it was a phone call from my mother, back in the days before portable communication devices. “Nana died, I think you should come home,” she said. The funeral proceeded in a similar manner as my cousin Kirk’s funeral. When I lived “away” in New Hampshire, my mother always made a point to let me know when various people from town died. She clipped the obituary from the local paper and mailed it to me and if the death was of importance (meaning “perhaps you should come home to attend the funeral”) she would call me. According to the 2010 U.S. Census, Maine has the oldest population in the nation. Like my mother, I now get the local paper and scan the obituaries closely to determine if a sympathy card should be sent or a funeral is on my calendar. Sometimes Helen and I discuss the deaths in the paper or we review the long list of Franco-American names repeated during the French Mass on Saturday evening. On Wednesday, a woman in my brother’s high school graduating class died. She and her parents attended Holy Family Church and I can see the pew they regularly filled in my mind’s eye. I don’t know how she ended up living in Dallas, but the Facebook posts indicated Debbie’s wish was to be buried in Maine with her parents. Her cancer had been financially devastating; her husband set up a “Give Forward” crowd funding page to help defray the costs of bringing her home to Maine. I tossed and turned last night, thinking about all this. Intellectually, I know that once we die, we are somewhere beyond the scourge and pain of death; what remains of our corporeal body is of less significance. For the dead, the suffering of this world is finished. Yet, this desire to be buried alongside one’s mother and father saddened me. I thought about how long I had wanted to be among the living of my own family for a multitude of reasons, including the ability to be with them in their final hours. In Muriel Spark’s novel, Memento Mori, a mysterious crank caller reminds the characters “remember, you must die.” None of us know when we will die, but part of living well is having some comfort with the idea of our finality. Live well today and if you cross grief in your travels, embrace it. This entry was posted in Friday Pillow Talk and tagged Memento Mori, Muriel Spark, three thousand mile screwdrivers. Bookmark the permalink. There is a great deal contained in your blog post for today. It does seem that death and how best to deal with this very present and integral part of living is a topic you and I have been ruminating about, in our writing, as well as during our recent face-to-face times of conversation and walking. Wasn’t it you who told me that Dr. Weil advised walking and talking, for some purpose that I can no longer recall? If so, I commend him. Our decision to incorporate human activities and actual in-person conversation, is a positive step. As I mentioned the other day, we all have an end date; we just don’t know when it is (and we live like it will never arrive). Yes, Dr. Weil spoke of the connection between walking and the brain, that the action of walking and the counter-movement of the arms potentially stimulated the brain. I would need to get my hands on a copy of “Spontaneous Healing” for the exact information. I can find no reason (short of an orthopedic malfunction on one of our parts) to discontinue walking and talking.